Mr. Feeny has arrived! The photo above strikes a nostalgic chord for those of us who fondly remember Boy Meets World, as it shows the 90s series' co-stars William Daniels and Maitland Ward on the set of the sequel pilot Girl Meets World. The picture comes courtesy of Ward, who played Rachel McGuire in the later years of the series. And it's one of a few photos that have surfaced since the Disney Channel pilot went into production. EW shared the photo above, along with this one, which was posted via Instagram by Ben Savage and shows his "first class." As EW puts it, Cory Matthews is all grown up and teaching junior high (at his daughter's school). There's an interesting reveal! With the potential series set up to center on Cory and Topanga's daughter, Riley, played by Rowan Blanchard, having Dad around as a teacher would certainly give Savage a more prominent role in the series, much in the way Mr. Feeny was around in the original series. It seems particularly fitting that these photos should be posted together, as Mr. Feeny was Cory's teacher and life mentor, and now it sounds as though Cory has followed in his mentor's footsteps in becoming a teacher who may end up guiding other boys (and girls) who are in the process of meeting world. 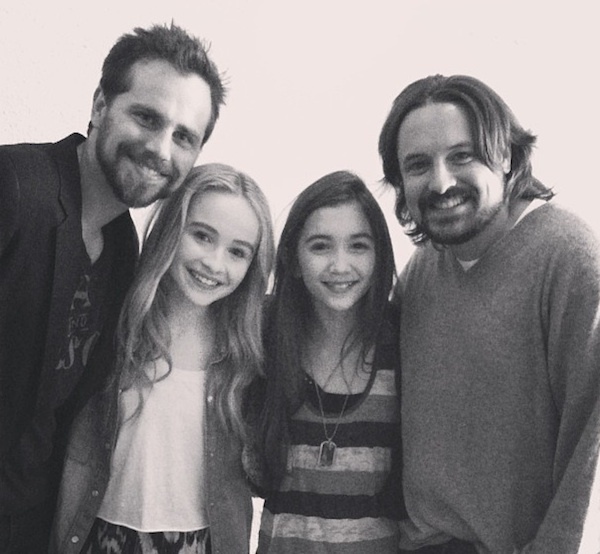 Speaking of stars of the original series, Blanchard Instagrammed this photo, which includes Rider Strong (Shawn) and Will Friedle (Eric), who came to visit them on the set.